Research focuses on biogeochemical cycling and transport within the soil as it extends to the atmosphere and subsoil. Our ultimate objective is to maximize sustainable productivity of agricultural systems. We have particular interest in nitrogen because nitrogen frequently limits production and is easily lost from agricultural systems to the surrounding environment, where it represents an economic loss to farmers that can diminish air and water quality. 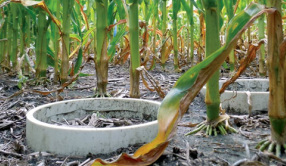 Minimizing nitrogen limitation on crop production while maximizing nitrogen retention within agricultural systems is among the most important global research priorities of the 21st century. To reach these goals we use agronomic, ecological, and biogeochemical principles to advance our basic understanding of element cycling and improve ecosystem management. Cover crops are an integral component of cropping systems because they grow in the fall and early spring - that is, times when the soil would not have a growing corn or soybean crop. At present, cover crops are grown to benefit soil quality and reduce nitrate loss. In the future, ongoing research at ISU promises to identify additional benefits such as weed suppression. Cover crop acres are growing exponentially. The Iowa Nutrient Reduction Strategy highlights cover crops as a flagship strategy for nitrate loss reduction. We are working to understand how cover crops can be inserted to corn-based crop systems to maximize cash crop yield, soil quality and nutrient loss reduction. Soil organic matter increases crop yield amount and stability. Soil organic matter - not nitrogen fertilizer - is the largest source of crop nitrogen uptake and environmental nitrogen loss. For example, approximately 10% of Iowa corn acres are non-responsive to nitrogen fertilizer in any given year despite yields that exceed regional averages- however, predicting those acres is extremely challenging. To increase nitrogen retention and nitrogen use efficiency, we must improve our understanding of the processes that control inorganic nitrogen fertilizer transformation to soil organic matter, and subsequent re-transformation of soil organic matter back to crop-available inorganic nitrogen (a process known as 'mineralization'). Our civilization depends on continuously increasing levels of agricultural productivity, which itself depends on (among other things) the interplay of crop varieties and the environments in which these varieties are grown. Hence, to increase agricultural productivity and yield stability, it is necessary to develop improved crop varieties that deliver ever more yield, even under the variable weather conditions induced by global climate change, all the while minimizing the use of inputs such as fertilizers that are limiting, expensive or have undesirable ecological impacts. By coupling a network of innovative, low-cost nitrate sensors across multiple environments within the heart of the corn belt and advanced cropping systems modeling (APSIM, the most widely used modeling platform), the proposed research will enhance our understanding of and ability to predict yield and Genotype x Environment interactions. The integration of nitrate (N) dynamics into this model is expected to greatly increase the accuracy of its predictions. Because we will also integrate genotypes into this model, the proposed research outlines a new and innovative approach for breeding crops that exhibit increased yields and yield stability. It will be possible to readily translate this approach to other crops. By generating data on nitrate concentrations in soil and in planta at unprecedented spatial and temporal resolution at multiple sites with different soil characteristics and weather, the proposed research will also improve our understanding of N cycles in both the soil and plant. 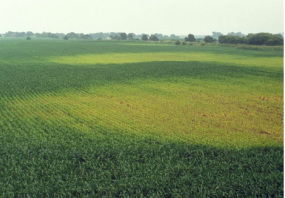 Although essential to plant growth and high yields, when over-applied N can result in a variety of serious negative externalities, some of which are currently the subject of high-impact litigation in Iowa. Project outcomes have the potential to provide guidance to farmers about how to apply sufficient but not excessive amounts of N fertilizer, resulting in both economic benefits to farmers and positive environmental externalities.Our focus on creating a new approach to breeding for yield stability meets the USDA sustainability goals to "satisfy human food and fiber needs" and "sustain the economic viability of farm operations". Our focus on nitrogen meets the USDA sustainability goals to "enhance environmental quality" and to "make the most efficient use of nonrenewable resources...and integrate, where appropriate, natural biological cycles and controls". More specifically, this proposal addresses the NIFA-Commodity Board co-funded priority for "development and application of tools to predict phenotype from genotype" and the "the development of high-throughput phenotyping equipment and methods".